버지니아 레일웨이 익스프레스(영어: Virginia Railway Express, 이하 줄여서 VREX)는 미국 버지니아주 지역에 여객 철도 운송업을 하는 준공영 기업이다. 1992년에 운행을 시작 했으며 북부 버지니아 교통위원회와 포토맥 앤드 래퍼핸녹 교통위원회가 관리한다. ↑ 가 나 다 라 마 바 사 아 “Virginia Railway Express”. The Diesel Shop. 2010년 7월 8일에 확인함. ↑ “VRE Equipment”. Virginia Railway Express. 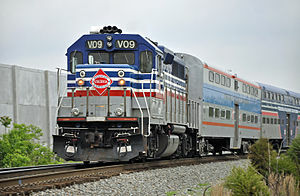 ↑ “VRE taps MotivePower for 12 locomotives, option for 8”. 2009년 8월 18일. 2010년 7월 8일에 확인함. ↑ “VRE has $5.1 million surplus”. 《Washington Post》. 2010년 9월 20일. 2010년 9월 20일에 확인함. ↑ Buske, Jennifer (2010년 8월 5일). “Virginia Railway Express begins adding new locomotives to its fleet”. 《The Washington Post》. 2010년 8월 5일에 확인함. ↑ “Virginia Railway Express orders gallery cars”. Railway Gazette International. 2012년 2월 17일. 2012년 2월 18일에 보존된 문서. 2012년 2월 18일에 확인함. 이 문서는 2018년 9월 12일 (수) 03:33에 마지막으로 편집되었습니다.